If that is where you find yourself–in a place where things seem dark and hopeless, despite the fact that you do know God and are strong in Him–I want to encourage you today. First, know that you are not alone. Jesus was a Man of Sorrows, and He knows how you feel. Let us remember that Jesus is the one who groaned in agony of soul and spirit in Gethsemane. He cried out to Father to deliver Him from the torture He knew He was about to endure. He also bore our sorrows–including our sins and failings, guilt and shame–right up onto the cross. He took everything that makes us sad with Him onto Calvary’s tree. He did it to heal us. He did it to make a way for you and I to live in victory. That’s important–but I also want you to know that it’s important simply that He understands what you feel like, even if you haven’t achieved victory yet where you are. Because He was, and is, the Man of Sorrows. And of the fact that the Scripture says in Psalm 23 that we walk “through” that valley. Right now, my life feels like I’m walking through that valley of the shadow of death. Correction: Actually, it feels like I’m IN that valley with no through or end in sight. My baby was born four weeks ago today, and he has had major feeding issues since birth. Horrible, awful feeding issues. My baby is in pain, and I can’t help him. We’ve been getting the runaround from multiple doctors. Few of them seem to care. We’ve so many doctor’s appointments that I’ve lost count. We’ve been in the emergency room at our local children’s hospital. And our baby screams and screams, wails and flails, and vomits rivers. It’s horrible. Not even counting the fact that I’m still trying to recover from his birth myself. But my Lord says I’m walking through. Frankly, I don’t see the end. I don’t know how he’ll get better or how long it will take. My Scripture for the year talked about my help coming from the Lord, and the enemy is trying to get me to believe that that means my whole year will be hellish. It’s a challenging time. I don’t see a lot of light in these issues. They are oppressive and harmful. But I do see nothing but light in the face of my Savior. Oh, Jesus. I need You. I need You so much. Please, help me. Help him. Help us. When we walk through the valley of the shadow of death, we will fear no evil for He is with us. And although we would love to know the solutions–I know I would, anyway–sometimes all we can know in this moment is He is with us. And that is why we can fear no evil–because His presence is enough. His presence has always been enough. When I went through a very long period of depression and financial nightmare several years ago, He was with me. When I have been through unjust situations too horrible to name here, He was with me. When my family broke apart when I was younger, He was with me. I didn’t even know Him yet–but He was with me. All the days of my life, even long before I had given my life to Him–when I was depressed, suicidal, angry, hateful, and more–He was with me. And He is with you too, no matter how dark the valley is that you’re going through. And He is light itself. And the light shines in the darkness, and the darkness did not comprehend it” (John 1:5). The light, or Light–Jesus–shines in the darkness, but the darkness doesn’t and didn’t comprehend it. Why? Because darkness has nothing in common with light. Darkness flees when light comes. And your darkness flees when Light comes. When Jesus becomes manifest in your situation. So I leave you with this word of encouragement today: look at Jesus. Lift up your eyes, for He is your Redemption and ‘your Redemption draweth nigh.’ Let’s look at Jesus bigger, you and I. Let’s gaze at this One who is the Way, the Truth, the Life, and the Light of men. The Light of you, and the Light of me. Let’s lift up our eyes, away from our navels and up into the face of Jesus. Because He is with us. He is for us. He will never leave us nor forsake us. He understands. Will you look at this One who is the Light and Life today? Thank you for this timely word… it’s bringing major confirmation to me about my situation and I feel so loved by God. Blessings & favor over you & yours, my friend! Praying for you and baby. I wish I had some good mother’s advice for you. Maybe put a pillow on your lap and him tummy down as you pray and sing. I can tell you are worried and I know there aren’t many pediatric gastro drs.out there. Praying for you and your new bundle….healing and the Right person in your path to assist you and your son. Is it possibly colic? “Lets lift up our eyes away from our navels and up into the face of Jesus.” This brought me to tears. Thank you for this reminder at such an appropriate time. Good word sister. I will be praying for your family of 3. We know all about screaming babies, countless doctors appointments, sleepless nights – utter exhaustion. Sending prayers your way for strength, wisdom, and healing. Blessings. Amen, thank you Jamie for taking time out of your heartache, I started sqalling like a baby also, prayed for you guys, and he heard them and is on them . Plus , I feel the same despair in all the stuff going on in our situation, but it’s all about Jesus, he Blessed me reading your email this morning, thank you so much, and yes, we’re fixing our eyes on you King Jesus, Hallelujah. I have 2 sources of income being so sec and small pension. Jesus took a basket of 2 fish & 5 loaves of bread, blessed it, handed to disciples. 5000+ were fed with 12 baskets left over. If my 2 sources of income = the basket, and Jesus blesses it, what if it could pay my creditors, who = the 5000+ ??? I call it the 2-5-J plan. What do you think? I am ecstatic about 12 baskets left over after my creditors paid !!! !!! Jesus is LORD !!! to the Glory of ABBA Father. Dear sister Jamie, I pray healing over your baby in the Name above every name, Jesus! He sent His Word and healed your baby and delivered him. Psalms 107:20, I also pray restoration over your whole body. Thank you for these words, really they came in a time of need. I will continue praising even when I can’t understand or know when this will end. I will exalt my Lord and Savior. I am glad you are choosing to look up into the face of our Lord and place the burden on Him. May He continue to lift you, the baby, and your husband as you walk through this dark valley. He is our Light. His love has made you strong though you may not feel it. May He give you peace in this trial. In Jesus’ name, Amen! Praying your baby is cover with Isaiah 53 healing, in Jesus name and that you find rest. I am seeing so many attacks against God’s people, especially the ones who are making a dent in the darkness. I have a friend who has been hospitalized a month. I feel tired, anxious myself. I recommend Hope Prevails for people with depression, by Dr. Michelle Bengston, don’t neglect yourself, as a first time mother, you need to recover too. My husband and I are praying for you and your family. We are so grateful for you and your ministry. This blog has been such a blessing to our lives. We are standing in agreement that your baby will be healed and whole in Jesus name. Thank you for all that you do and always leading us to Jesus our light. Even in your valley you are still a blessing to many. I am sending you this in the hopes that it might help. I am a mother of 2 who both had horrible feeding problems. Evrry feeding was folowed by throw ups. The vomits smelled acidic. And it was followed by horrible cries of pain. Just when you have finally put them to bed and are fast asleep, they would suddenly wake up with screams of pain. The doctor said that they were colicky. I had acid reflux once in a while and it is awful. The symptoms looked the same. So i asked my dr if my babies could have it and it turns out they did. The valve that separates their stomach from their eusophagus had not yet developed and so the stomach acid was coming up through their eusophagus and burning the delicate lining. So my children got acid reflux medications and they did not sleep flat on their backs for 6 months. They had to sleep in an angled position so the food would stay down. So theyslept in a baby swing and/or their baby car seat. It lasted until they started eating solids. Being a mommy is the hardest job ever. And yet I would not trade a single day even when my babies and I were in “the valley”. Dear sis Jamie,I thank God that in every situation we will always look up to Jesus,I pray total healing upon ur son now in Jesus Name that every knee would bow at the mention of His Name that includes ur baby,that sickness will bow at the feet of Christ. Jamie you are such an encouragement to the Body…….praying for the God of all Comfort to single you out and give you special attention. Praying for a miraculous breakthrough and your heart would be encouraged in the midst of this adversity. Actually, more waters flowing through you because of it. More examples of the wonder working power of God you’ll write about. For you to be able to give such great words of encouragement while you your self is going through a dark place says a lot. Father I come in to agreement with all of these prayers prayed over Jamie, and her family, and Lord I also come into agreement with all the prayers Jesus is interceding for them, Lord I ask for healing of this baby in body mind and spirit, and also strength , joy and peace for Jamie and her family, Lord I ask for knowledge, wisdom, understanding, and discernment be given to all the care givers in Jesus name to sort out the truth of this matter, Lord that your truth will be revealed, quickly in Jesus name,amen and amen. for your glory Lord, amen. I read of your son’s plight.It broke my heart and took me back 42 years ago when I became a mother and my son couldn’t digest his formula.Please consider seeing a naturopathic physician and a chiropractor who has adjusted infants.I will keep you all in prayer and ask God for quick healing and release. Praying for your baby and family! God is with you , you will see his glory soon, in the name of Jesus our Lord and savior!!!!???? Have you tried a good chiropractor? I have a friend who is a godly Christian holistic chiropractor who adjusts and sees instant relief for babies that are suffering similar to the way you are describing your precious baby. Praying the Lord leads you to the right one if this is the answer. And praying peace for you, sweet Sister. You are such an incredible blessing!! Thank you for the word so timely “You, O Lord, are a shield for me,My glory and the One who lifts up my head.Psalms 3 :3,God will reign in your family and Baby Elijah will receive healing and you restoration in Jesus Mighty Name and strength to your husband. I pray that the Lord will bring to you revelation as to what you need to do to help your baby. Take time to be still, as especially now with the baby having so many issues it is difficult to hear the small still voice of our Lord. But it is there. And He has an answer. I remember my own issues with my son, and his feeding issues, and one thing that comes to mind is the food that you may be eating. There may be something there that is too harsh for him. I say this hesitatingly, because I’m sure you’ve already visited this path as well. Show you the answer. Be still and know. Be blessed with His presence and His peace. Good morning Jamie, your words have been such a blessing to me this morning, saying a prayer for your baby and family today. I join with your faithful followers in prayer for the total restoration and healing, and complete VICTORY over ALL that you are up against as we plead the blood of Jesus Christ our Lord and Savior. We claim all God’s promises this day as we call all heaven and earth together that it shall be written that through prayer and supplication with thanksgiving we claim the God given supernatural VICTORY over ALL that is not from God, and claim the powers and promises of the precious blood of Jesus for this precious family. As the blood of Jesus covers all; Jamie, her husband, precious baby, their household, their businesses and finances we give praise and glory to God for His provision, and protection, and victory over all that is needed to bring complete restoration in Christ holy name, Amen. May God’s extravagant endless love pour over you, and your family, and immerse you in bountiful blessings, and God’s fullness fills you to overflowing, Hallelujah! Thank you precious warrior we love you Jamie!!! I’ve just prayed for total healing for baby in the name of Jesus Christ and that this vomiting or pyloric stenosis stop now in Jesus Christ name. I prayed baby witll drink his milk and be nourished by his milk. I prayed him happy healthy content comfortable and grow healthy and strong. Able to feed sleep poo and reach all his milestones on time.etc. I prayed you’ll be able to enjoy your baby Amen. In the mighty name of Jesus Christ. Amen. Prayers of agreement and words of authority through Christ that your baby is completely healed of this and for peace of mind for you and your husband. The Goliath of the American medical system needs to be brought down by a David. This has never been more apparent to me than in the last several years with private practice doctors literally being forced to join these large medical campuses and leave their private practices. These large campuses allow poor doctors to hide in the system, too and show their indifference to patients and forgetting the Hippocratic Oath they took. God is the healer and doctors CALLED to the professions to be used of God to help people are the true doctors. May those continue to practice and the others move to other careers and get out of the profession. Hi, your baby might have “silent reflux” and would benefit by taking “Siberian pinenut oil”. Find a brand that is reliable, pure and cold pressed. Hope this miricle oil is your answer too! Have they checked your Son for acid reflux ? My Son had a horrible case when he was born.The flap in his stomach had not fully developed so his milk would come back up. He would cry in pain and would throw up after feeding. It was the worst feeling to watch him suffer. It happens to first born male babies especially if there is a history of it. Turns out my husband had also had it as a baby. The test for it is easy and there is medications that you can give before feeding that will help. praying for you all. DEAR SISTER JAMIE, I AM PRAYING FOR YOUR BABY TO RECOVER OF THIS EATING ISSUES IN THE NAME OF CHRIST JESUS. THAT THE ONE DOCTOR WILL FIND THE BEST TREATMENT AND WAY TO HELP YOUR BABY, THAT THE LORD SEND YOU AND YOUR HUSBAND REST, PEACE AND STRENGHT. I PERFECTLY KNOW HOW DO YOU FEEL IN THIS SITUATION. WE HAVE AN ALMIGHTY GOD WHO NEVER DELAYS. YOU ARE A HUGH CHRIST LIGHT THROUGH YOUR BLOG. MAY HE OVERBLESS YOU AND YOUR LITTLE ONE. Jamie, what a blessing you are to the Body of Christ! In spite of what you’re going through, you still manage to encourage others. That’s what a real soldier of Christ is. Praying that your baby will be healthy and you and your husband will have double blessings for your trouble. Jamie, as soon as I read this post, I started praying for you and your baby. I prayed that both of you would be healed completely in Jesus’ name. I asked him to not tarry and answer immediately. You have been such a blessing to others, I pray that Jesus would shorten your valley experience. I lost my mother last May, so going through my own personal valley of grief. I pray for The Lord’s mercy every day to help me through this as it has knocked me sideways. But God is still faithful. I am so sorry to hear Elijah is still having problems feeding. I pray for strength for you all and that God will bring resolution to this difficulty quickly now. You are a true woman of God to be thinking of us and still ministering to us whilst in the thick of your own trials. I had some difficulties with my son’s feeding also- many years ago- and also recommend taking your son to a chiropractor for a check-up and adjustment if needed. In Canada, children under 12 years are no charge to see a chiropractor. I am not sure how it works in the US. If anything is out of alignment, it severely affects numerous bodily functions…. a chiropractor can easily put it back the way God intended it to be so your son can function the way he was meant to. Please keep us up-dated on how he is doing! Dearest Jamie, I am really sorry that you are having such a difficult time with baby Elijah right now, especially after having to endure a C-section! I know that that alone can be tough to recover from (I had to have 3). I am asking Holy Spirit to hover over you and Elijah, especially when he’s crying and your nerves are raw and on edge. I also ask Father God to help you find the best doctors to diagnose and treat your son’s condition. And lastly, I ask King Jesus to rule completely over this situation and to give you His confidence that He WILL see you all through this “dark valley” experience. 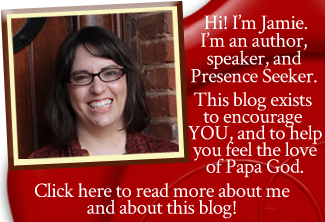 Jamie, you have been soooo incredibly faithful in blessing all of us with your online ministry. And I want to thank you personally for.your awesome obedience to Christ ! Your willingness to continue to minister to the body of Christ during this difficult time brings me to tears…just know that you and your family are in our thoughts and prayers. And remember: When we are the weakest, He is the strongest! Blessings and peace ??? Evangelist Dianna Hobbs had such a case with her newborn baby and the doctor found out that the baby lacked a uvula. She prayed and stood in faith and when the baby returned to the doctor, the doctor said she had never seen anything like this in her life. I am not saying your baby is lacking a uvula but you might want to have it checked. I am standing in faith with you that your baby is healed, in the name of Jesus, Amen! You are most certainly not alone in your struggle. Us, The Church & Bride of Christ, are with you in spirit. We carry your burdens WITH you, alongside you. You. Are. NOT. Alone. You just keep your eyes on the Author & Finisher of your faith! & THANK YOU for all the prophetic words of encouragement that you have POURED out upon us, lovingly, faithfully, & obediently, DESPITE whatever pain & struggle you were facing. Just KNOW, that though it tarry, your reward is certain, & SURE to come. Because He is faithful. <3 He never changes. Period. You are loved. & Seen. & Known by God. & I know that you know all this, but, sometimes, you can’t help but reiterate them, you know what I mean? Love you, sis. <3 God bless! !